Here is where you can subscribe to read my novels, comics, and listen to audiobooks and podcasts. This is where you’ll see an organized guide to my artwork. If you like the art and want to own some, go here. I, Rebecca Migdal, am an author, artist, puppeteer, activist, animator and reformed loose cannon. Much of my creative work is based on weirdly vivid dreams I’ve had. This has resulted in some unforgivable puns. It’s okay, though. I only find myself complaining about it on occasions like this, when it is sure to be an embarrassment. I recently moved to Easton, Pennsylvania with my bestie Andy, where we live in an oversized house with a motley family of puppets. 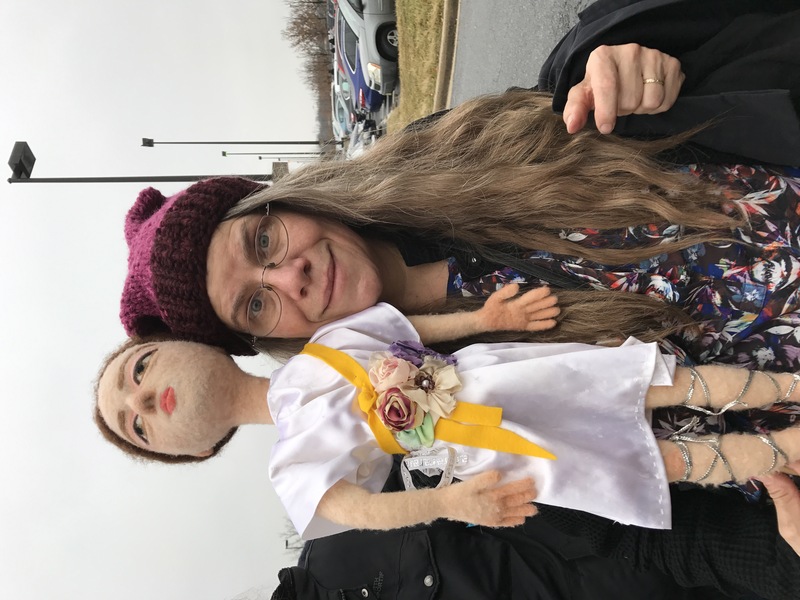 That’s me, Rebecca Migdal, with my Artemis puppet, on the way to the Women’s March in Washington DC.